Product prices and availability are accurate as of 2019-04-15 10:22:07 EDT and are subject to change. Any price and availability information displayed on http://www.amazon.com/ at the time of purchase will apply to the purchase of this product. 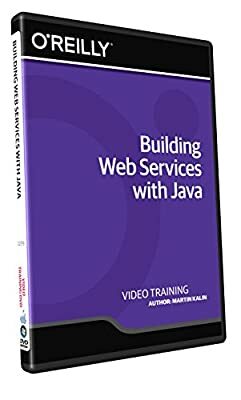 In this Building Web Services with Java training course, expert author Martin Kalin will teach you how to write REST-style and SOAP-based web services. This course is designed for users that are already familiar with Java, however no experience with web services is required. You will start by learning about the main uses of web services, then jump into learning how to code and publish a web service. From there, Martin will teach you about the Java REST framework, as well as give an overview of JAX-RS and Restlet. This video tutorial also covers REST-style from the client side, as well as XML-Java conversion in REST-style clients. You will also learn about SOAP-based web services, SOAP-based web services on the client side, and web services security. Finally, you will learn about users and roles. Once you have completed this computer based training course, you will be fully capable of writing your own REST-style and SOAP-based services. Working files are included, allowing you to follow along with the author throughout the lessons.